Took a few extra hours, but it's available to download on Steam. 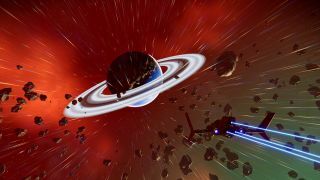 After a bit of a delay—we were expecting the update to arrive at 6 am Pacific—the No Man's Sky Next update has arrived and can be downloaded on PC. While you're waiting for it to download, you can take a look at the patch notes to see what Next includes. Communicate with other players vocally using a headset, and / or converse using text chat on PC. While wandering the galaxy solo, continue to experience chance encounters with strange floating orbs. So it sounds like you see your friends as fully realized characters, but see strangers as orbs. I think? I guess we'll find out today, as soon as two players who aren't friends run into each other. New mission types have been added, including photography missions (which sounds like just the sort of thing I'd enjoy), hunting, archaeology, freighter attacks, and more. The patch notes state that creature movement and AI has been improved as well, and it also sounds like sentinels may now be easier to battle. Base-building has been expanded with hundreds of new parts and teleporters can be placed anywhere on a planet. Players can also own multiple bases, and they can be built anywhere. Rather than a single freighter you'll now be able to command a fleet, and even conduct real-time missions with them, call them in to help out with space battles, and get their assistance while exploring systems. Crafting has been overhauled as well, with new resources to find and a system based on a planet's biome and classification. There are also resource refineries to convert raw substances into other materials. Visual improvements include new clouds, ringed planets, improved hazardous storms, and planetary changes that will allow for bigger and deeper oceans and buried ruins to discover and explore. There are also changes to the UI and scanner, and an improved build menu, plus enhancements to the audio and sound effects. Hello Games is also planning weekly community events, and have set up a pretty nice looking Galactic Atlas website to pinpoint community hubs, events, and discovery stats.